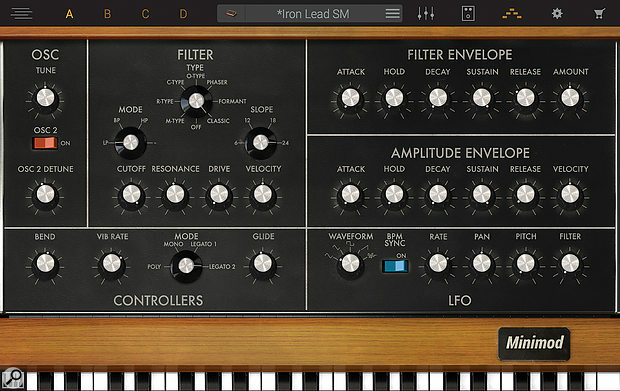 While each of the 17 instrument categories offer a different visual look — in this example, a Moog-inspired styling — the underlying control set remains the same. If a rare and expensive collection of analogue synthesizers continues to allude you, IK Multimedia have just the thing. With classic analogue synth hardware being highly sought after, highly priced, and sometimes temperamental, it’s not surprising that the cost and convenience of software that models the classics from Roland, Yamaha, PPG, Moog, Oberheim, Sequential Circuits and others have proved very popular, even if it doesn’t always have the cool factor or tactile vibe of the real thing. 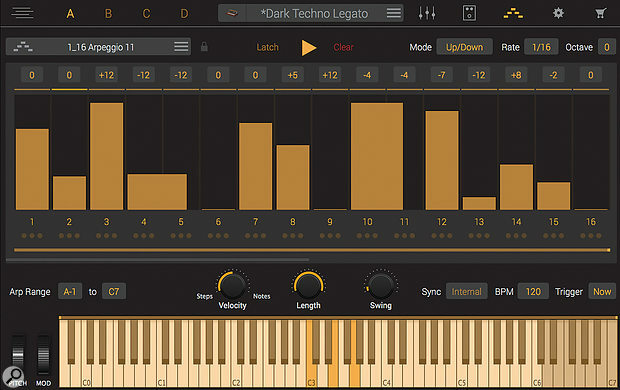 IK Multimedia’s latest offering to this already well-populated market place is Syntronik, and while at one level it is simply another ‘virtual analogue synth’ instrument, it does offer some distinctive elements. So, if you are looking to add the sound of some classic analogue synths to your sonic arsenal, and like the idea of a one-stop-shop for all your virtual analogue synth needs, is Syntronik a suitable candidate? IKM describe Syntronik as a ‘hybrid’ instrument. In essence, sampling has been used to capture the sound of the oscillator section of each of the 30-plus hardware synths represented, while the second half of the sonic equation — the filters, LFOs and effects — are modelled in software. This modelling includes IKM’s own DRIFT technology, which attempts to reproduce the underlying sonic variability of old-school analogue synth hardware. The sample-base for Syntronik’s ‘hybrid’ sound engine is substantial. You can plump for the full package and this offers over 1200 preset sounds built from some 60GB of sample data. There is, however, also a ‘free’ version with a few presets so you can try before you buy. An in-app store then allows you to purchase more sounds if you decide to go further. In the full version, velocity-based multi-sampling and round-robin samples contribute to the 70,000 individual samples. The presets sounds, while derived from over 30 original hardware instruments, are organised into 17 instrument groups within Syntronik. So, for example, Syntronik’s Minimod instrument (shown above) contains sounds based upon the Modular Moog, Minimoog Model D and Moog Voyager. Other ‘families’ of the hardware synths sampled form the rest of the Syntronik groupings. Aside from the 60GB download (although you can pay a little extra for a USB drive version if you prefer), installation and authorisation of Syntronik is painless. 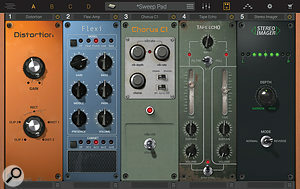 Once installed, the instrument will run either as a stand-alone application or in one of the standard plug-in formats (64-bit only). Incidentally, as outlined in the ‘Going Mobile’ box, Syntronik is also available in an iPad-based app format. Syntronik runs both stand-alone and, as shown here within Cubase, in all the common plug-in formats. The main interface can be resized to suit available screen real-estate and the full Syntronik feature set is spread across a number of pages, accessed via the tabs at top of the screen. The central section of this tab strip shows the current preset name and provides access to the preset browser. This browser includes filter options based upon both the 17 synth categories mentioned earlier and various timbre, style and genre categories. The Layers Panel allows you to configure up to four Parts into a more complex preset.Once you have loaded a preset, if you don’t toggle on one of the other screens described below, by default, you then get to see the control set for the selected instrument group. These are interesting in that each adopts a graphical look that represents that of the original hardware. In total, therefore, you get 17 distinctive ‘looks’. However, in each case, the actual control set is the same. As shown in the various screens, this includes options for engaging (and detuning) a second oscillator, selecting and configuring a filter type, adjusting the filter and amplitude envelopes, a Controllers section (for example, to switch between mono, poly and legato modes) and an LFO section where you can configure the LFO waveform/rate and how the LFO modulates the pan, pitch and filter. To the left of the tab strip, the A, B, C and D buttons select any of the four sound slots (Parts) that are available. You can therefore load up to four presets at any one time and, with the Layer Panel (the button located at the top-left), you can layer these sounds, set any key ranges/splits required and adjust the velocity response of each layer. There is considerable potential here to build both big sounds and, using the Layer Panel’s own preset system, to create some flexible live performance configurations. The Part Control Panel allows you to quickly adjust the volume/pan of the currently selected Part.On the far-right you can access the in-app Store (to purchase sounds if you have started with the free version of Syntronik) and the Settings button allows you to configure things such as the audio and MIDI setup (when working stand-alone) and set Program Change data (again, useful in a live performance context) or sample library location. The three remaining screens all offer options that apply to the currently selected Part. The mixer button opens the small Part Control Panel (where you can set the volume and pan for the currently selected Part and the master output volume), the stompbox icon opens the Effects Panel (with five available slots for each Part), while the note-icon button opens the Arpeggiator Panel. The last two have plenty to offer and it is worth emphasising again that these are available on a per-Part basis; if you do choose to layer multiple presets, then each can have its own effects and arpeggiator settings. Even a quick look at the effects options shows that IKM’s software emulation of classic analogue hardware hasn’t stopped at the filter/LFO modelling within the synth engine, and there are plenty of the 38 effects types where the analogue hardware inspiration is very obvious. The effects are organised into six categories; amps, distortion, dynamics/EQ, modulation, reverb/delay and filters. For each Part, the signal path flows left to right across the five available slots. Syntronik’s effects options are impressive with up to five effects available per Part and plenty of vintage-inspired effects to choose from.While these ‘inspired by’ effects are not identikit clones of the originals, I have to say that there are some excellent impressions. Whether it’s the Tube Screamer-inspired Overscream, the Pultec-based Vintage EQ-1A or the very LA-2A-esque White 2A compressor, this is an impressive toolkit of effects to explore. And, while it is obviously difficult to separate the ‘analogueness’ of the underlying synth sounds from the extra ‘analogueness’ added by the modelled effects, I was particularly struck with just how genuinely warm and forgiving things like the EQ and overdrive effects were. The Tape Echo effect was also very good indeed. The Arpeggiator Panel is equally impressive. As well as the usual up, down, up/down, random, rate and number of octave settings, you also get a pattern sequencer with a variable step length of up to 32 steps. You can set step velocity, transposition, make a step a chord step, tie steps together to create longer notes, turn steps off, mix and match between the velocity in the pattern and the incoming MIDI velocity, apply a note gate (via the Length dial) and add some swing. The Arpeggiator Panel also offers its own preset system and comes stocked with a good number of example presets in different rate categories. 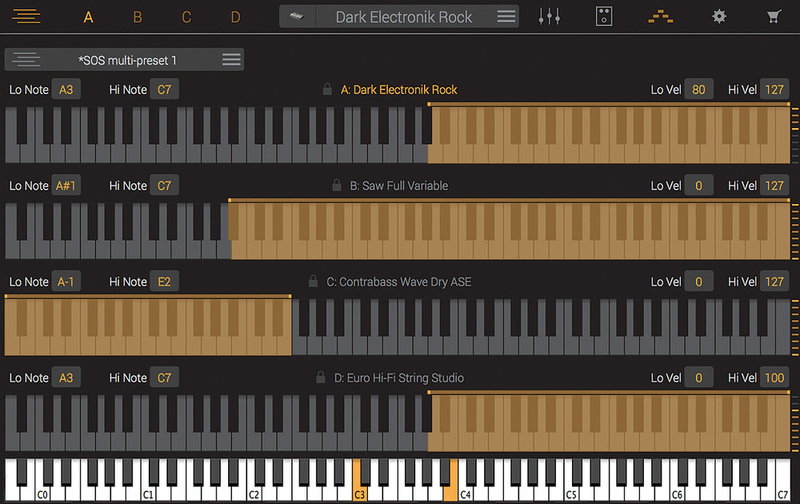 The bottom line here is that this is a heck of a lot of fun when applied to a single sound but, with different arpeggiator settings applied to any of the four available Parts, the creative options are multiplied. Oh, and do note that you can set different step counts for each Part; polyrhythmic arpeggiator madness lies this way. The arpeggiator is very well featured and, as with the effects section, is available on a per-Part basis. I did my own testing of Syntronik using both the stand-alone version and as a VST plug-in within Cubase. This was a very smooth experience and, aside from the usual loading time for sample-based presets (typically just a few seconds on my test system; fine in the studio but obviously something to be considered in a live performance setting as you move through your set list), Syntronik behaved very well indeed. Of course, all the technical wizardry described above for layering of multiple Parts, the effects and the arpeggiator is only worth worrying about if the underlying sounds cut the virtual analogue mustard. Thankfully, IK Multimedia have also done a very good job here. Indeed, the underlying sonic character of the samples is very impressive. Whatever the relative pros and cons of the hybrid engine that creates these sounds, the sounds themselves are excellent, and very definitely capture the weight and warmth that we often associate with classic analogue synthesis. With such a huge preset list and over 38 original synths represented (see 'Syntronik’s Sources' box), it is difficult in a review of this length to do justice to the range of sounds available but, if you want the underlying vibe of analogue synthesis without the price tag and reliability issues of the real thing, then Syntronik is a very attractive proposition. Let’s take a couple of instrument categories as examples; synth basses and arpeggios. Given the number of hardware synths represented within the presets, as you might expect, the bass synth sounds cover a pretty broad spectrum. This includes the impressively big and fat, and some of the presets within the SAM (Oberheim SEM) and Minimod (various Moogs) will most certainly get your sub-woofer working. There is a real depth, warmth and punch to many of these sounds and they respond very nicely to playing dynamics. That’s not all that’s on offer though; if you want more aggressive basses, sounds that cut through, or options that will hold the low end together within a contemporary EDM-style project, then there is plenty of that too, whether it’s from the J-60 or the T-03 or elsewhere. I am, however, also a sucker for a good arp-based sound and Syntronik had enough preset options here to keep me busy for some time before I wanted to roll my own. Whether it’s the cute Pro V-based Daft Disco Arp, the madness of the PPG-inspired Double Arp or the groovy (but slightly disturbing) Head Moving Arp SAM preset, you’re spoilt for choice. Sonically then, IK Multimedia’s hybrid approach to Syntronik’s sound creation is capable of delivering some truly fabulous analogue-style sounds and, whether in the studio or on stage, I’d have no complaints on that front. That said, given that you are working with samples of oscillators rather than actual (or modelled) oscillators, you could argue that you don’t perhaps get quite the same degree of flexibility that, for example, a fully modelled emulation of a specific hardware synth might offer. For potential users who are sticklers for the accuracy of their synth emulations, this might be a drawback. However, this design decision is one that is going to have strong appeal to a somewhat different audience. In particular, those that are perhaps less interested in learning how to program 30+ different synth emulations, but still want the character of sound offered by a who’s who of classic vintage synth hardware. In essence, you get plenty of the sonic character of that synth collection, but with a single programming interface to learn. In terms of the demands on the operator, it’s a streamlined approach. I think this final point pretty much captures who IK Multimedia are targeting with Syntronik. While this is not a budget product, if you are looking for a one-stop-shop that delivers a heck of a lot of classic analogue synth goodness but in an easy-to-use package, then Syntronik is a very credible option. The presets cover a huge range of sounds and, with the options for sound editing, effects and layering, even though you can’t tweak down to the oscillator level, you can still take the supplied sounds in an almost endless number of directions. 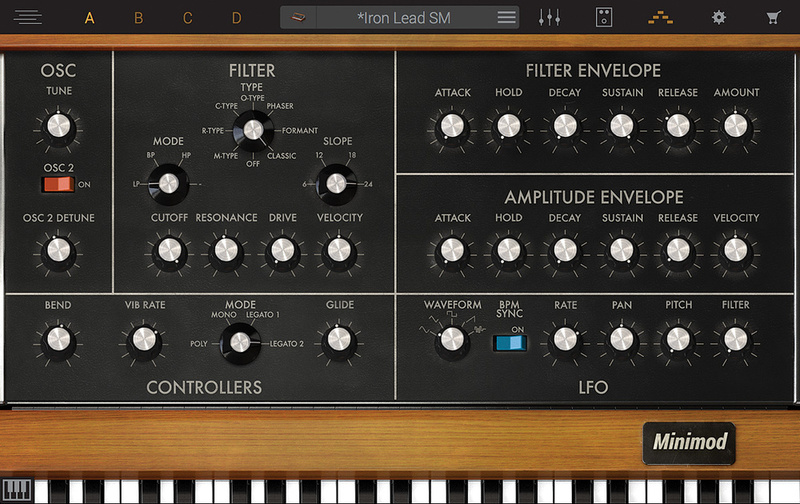 There are any number of virtual instruments that emulate specific synths from those sampled for Syntronik. However, if you want a single package that covers multiple synth options, there are perhaps fewer choices. For example, Arturia’s V Collection is a single package but actually consists of a series of 17 individual virtual instruments modelling different synths. 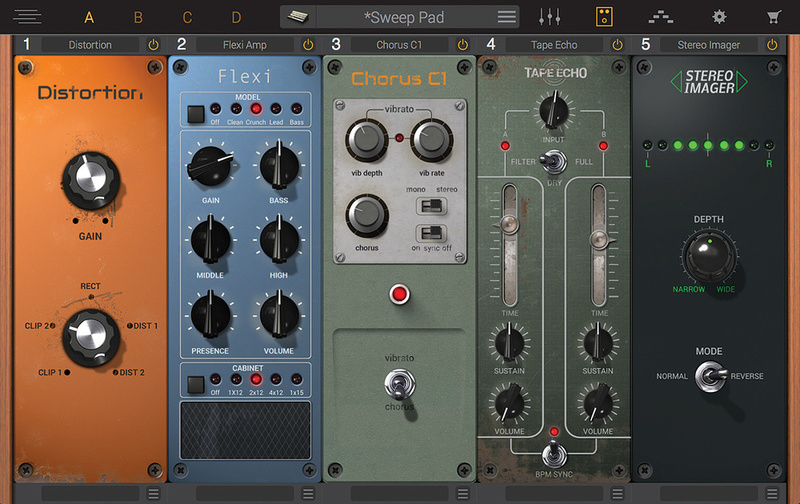 UVI’s Vintage Vault 2 offers a similar approach and includes drum machines as well as synths inspired by classic hardware. 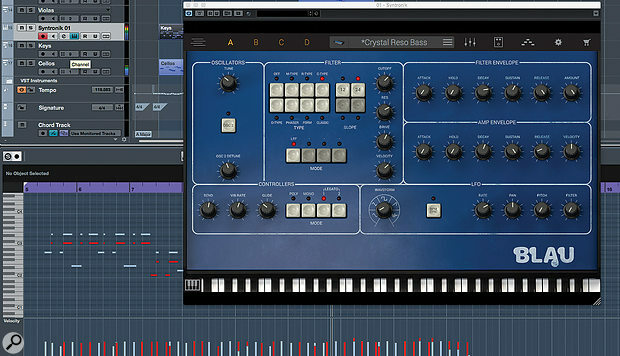 Perhaps closer in concept to Syntronik is Titan 2 from Best Service, as this is also built around a ‘hybrid’ engine combining samples from original hardware synths and modelled elements for filters, etc. The UI is perhaps a little deeper, but also less accessible, than that of Syntronik. 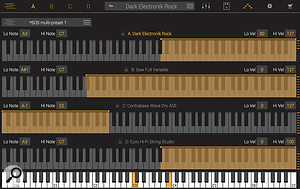 Syntronik is also available as an iPad app. The base app is free and includes a few presets for you to try. A few iPad tweaks aside, the UI and the modelling elements appear identical to the desktop version. The key difference is within the sample base with the iPad version fitting into a more mobile-friendly 575MB (as opposed to the 60GB of the desktop version). A £74.99$79.99 IAP (in-app purchase) unlocks the full iOS sound set although you can also buy separate IAPs for individual instrument groups should you wish. You get exactly the same presets on the iPad but, as might be expected given the very different sample sizes, compared side-by-side, the iPad sounds are perhaps a little less dynamic and punchy than on the desktop. Even so, they are still impressive and would make for a great analogue-style sound source while on the move. IK Multimedia have taken samples from the following 38 classic hardware synths to build the 2000 instrument presets found within Syntronik. Huge range of sounds covered in the preset collection. Effects, sound layering and arpeggiator features all very good. Some may see ‘samples’ of the oscillators as a limitation for programming. The price may put it beyond some potential users. Syntronik offers impressive analogue-style synth sounds drawn from a range of classic hardware instruments. Providing you can justify the price of entry, as a single source of analogue synth goodness in an easy-to-use package, it packs a considerable punch.